This is a moving and haunting 85 minute film that has been greatly appreciated by audiences around the world. Presented through evocative film excerpts and insightful comments, this fine documentary titled In Search of Guru Dutt, was made in 1989 for Channel 4 TV, UK. 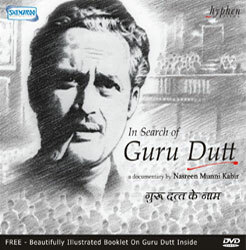 Based on extensive research starting in the mid-eighties by Nasreen Munni Kabir, some twenty-four years after Guru Dutt had committed suicide on 10 October 1964, the idea of the film is to discover work and personality of Guru Dutt.